Like it or not, the new Lightning dock connector is here to stay. It is already in use with the iPhone 5 and the iPad mini, among other devices, and will be present on all of Apple's portable gadgets from now on, replacing the now-obsolete 30-pin interface. The change renders all existing iPhone and iPad docks useless, unless one buys a $30 adapter from Apple. However, one can alternatively buy a brand new docking station with a Lightning connector on it, and JBL just happens to be the first maker to release one. 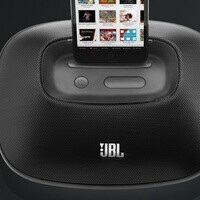 Introducing the OnBeat Micro by JBL: a light and portable docking station made for the iPhone 5. It is equipped with a pair of 2 watt, full-range speakers and can work either off four AAA batteries for up to 5 hours of audio, or using AC power. And since it weighs only 360 grams, you can take the accessory with you wherever you go. If you need something with a little more kick, then JBL is also offering the OnBeat Venue LT, which is compatible with both the iPhone 5 and the latest iPads with a Lightning connector. The accessory is equipped with a pair of 15 watt speakers, which makes it a lot more powerful than the Micro. However, it will cost you much more too. The JBL OnBeat Micro is priced at $100, while the OnBeat Venue LT can be ordered for $200. Both of them can be purchased from the maker's online store.